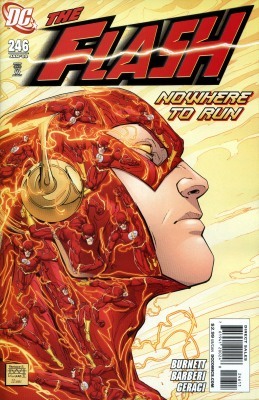 We’re moving into the home stretch, with the second-to-last issue of the current Flash series. Part 3 of “This Was Your Life, Wally West” is written by Alan Burnett with art by Carlo Barberi. The book was originally solicited with a more story-related cover by Brian Stelfreeze. Normally I prefer covers that have something to do with the story over iconic covers, but I have to say this is one seriously impressive cover by Freddie Williams II. Carlo Barberi’s art continues to work surprisingly well with the serious tone of the book (I’d previously known his work only from Impulse), and the cast list is combined with the issue’s splash page. 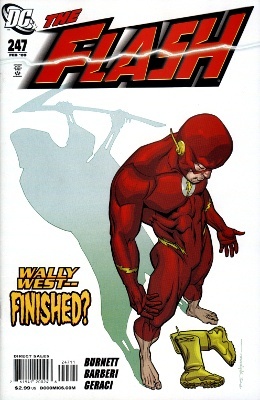 The threats of the Queen Bee and power loss take a back seat to a more personal story: Wally West faces the possibility that he might lose the love of his life, Linda Park West. 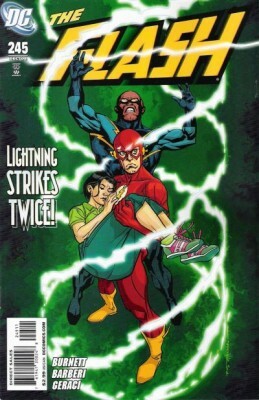 Much of the first half of the issue is a look back at Wally and Linda’s relationship, starting with their first meeting as reporter and story subject at the end of the “Porcupine Man” saga (Flash v.2 #24–28), working through their tumultuous courtship, interrupted wedding, all the way through to the worldwide memory wipe between Blitz and Ignition. The flashback is well-integrated with the main line of the story, as it brings up several elements that factor into the second half of the issue as the Queen Bee case takes center stage again. This entry was posted in Reviews and tagged Alan Burnett, Carlo Barberi, Freddie Williams II, Wally West on November 19, 2008 by Kelson. Last month I was pleasantly surprised to find the first issue of the four-part “This Was Your Life, Wally West” was quite good — in fact, the strongest opening chapter of a Flash arc in years. So does part two hold up? For the most part, yes, with some reservations. Admittedly, I read it right after reading the conclusion of Rogues’ Revenge, which is a tough act to follow. This issue brings in guest stars galore, both in the present day and in flashbacks, linking Wally’s two super-teams: the original Teen Titans, and the Justice League of America. Members of both (and the JSA) show up to help him deal with the new development revealed in part 1, while the Titans appear in a retrospective of his Kid Flash career. It seems thematically appropriate to team up the Flash and Black Lightning: someone who got his powers by being struck by lightning, and someone who generates electricity. Similarly, Red Arrow, while serving as a literal link between the two teams, was once known as Speedy — a name that would have worked just as well for a young speedster as it did for an archer with quick reflexes. This entry was posted in Reviews and tagged Alan Burnett, Carlo Barberi, Wally West on October 15, 2008 by Kelson. On Friday afternoon at Comic-Con, I went over to Artists’ Alley to see if I could commission a sketch of Impulse from Todd Nauck (Young Justice). He was talking with someone, and they kept talking for something like 5 minutes. When he walked away, it turned out that the guy he’d been talking to was Carlo Barberi — who drew Impulse during most of Todd Dezago’s run! I talked to Todd Nauck briefly, and asked for the sketch, but I had a panel to get to so I couldn’t pick it up. I went back Saturday around 1:00 or so to pick it up. He was doing a sketch of Secret for someone else. He mentioned that when he started doing Young Justice, he was a huge Impulse fan, but got to really like the other characters over the course of his run on the book. By the end, Wonder Girl had become one of his favorites, because of all the character growth he got to portray. 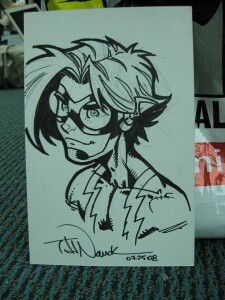 This entry was posted in Fandom and tagged Art, Bart Allen, Carlo Barberi, Cons, Impulse, San Diego, SDCC, SDCC 2008, Todd Nauck on July 26, 2008 by Kelson.